﻿Rev. D'vorah's Experiential Women's Wisdom Retreats feature poetry, writing, art, meditation, various religious/spiritual insights and your own valuable insights/experiences to fully explore each of the topics offered. A gifted facilitator of Women's Wisdom Circles, Rev. D'Vorah believes strongly in the power of the Circle to affect changes in a woman’s life. 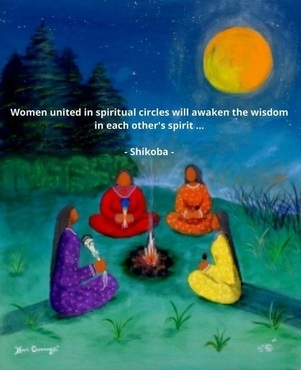 Whether you have an existing circle of women, or would like to co-create one in your area, these Wisdom Retreats will create safe and sacred space within which women can gather to share their stories. To read what women have said about the Wisdom Retreats, click here. *No woman will be turned away due to limited funds. Contact the event organizer to a partial scholarship. Send an Email Requet to Host A Workshop Retreat!